← Thumbs Up To Sidewalk Detour On Witherspoon Street! Recent debates over redevelopment in Princeton have focused on how ‘green’ new buildings might be. This is an appropriate question in a town that prides itself on being a sustainability leader in New Jersey. But what does ‘green’ look like? Recently, NRG Inc unveiled a new plan for a so-called ‘ultra-green’ headquarters in West Windsor. But despite some outstanding energy-efficiency measures in the building itself, the site is still in a sprawl-y office park that is mostly accessed by single passenger vehicle. A great article recently in Planetizen discussed the features of a sustainable building, noting that site selection is as important as site design. As shown in the graphic above, ‘Green Bling’ like solar panels is only one part of what makes a building sustainable. In Princeton, the conversation about sustainability often focuses on ‘show me the solar panels’. Solar panels are good, but only one part of the equation. The element of walkability is too often overlooked. Using an existing site in a walkable location is intrinsically green. This is especially so if we consider the findings of the ‘Route 1 Growth Strategy‘, which observed that building in existing population centers would enable more efficient transit in future. The LaneFab framework is also interesting, because it includes reference to advanced energy efficiency standards. In Princeton, many of us are familiar with the LEED framework for sustainable design. Two homes on Linden Lane have achieved LEED Platinum certification. This is great, but there are even higher sustainability standards that could be targeted. Advanced standards for green design. (click to expand.) via Planetizen. In Princeton, the days of building ‘code minimum’ buildings are probably over, and that is a good thing. Our green building code requires higher standards, with reference to LEED. 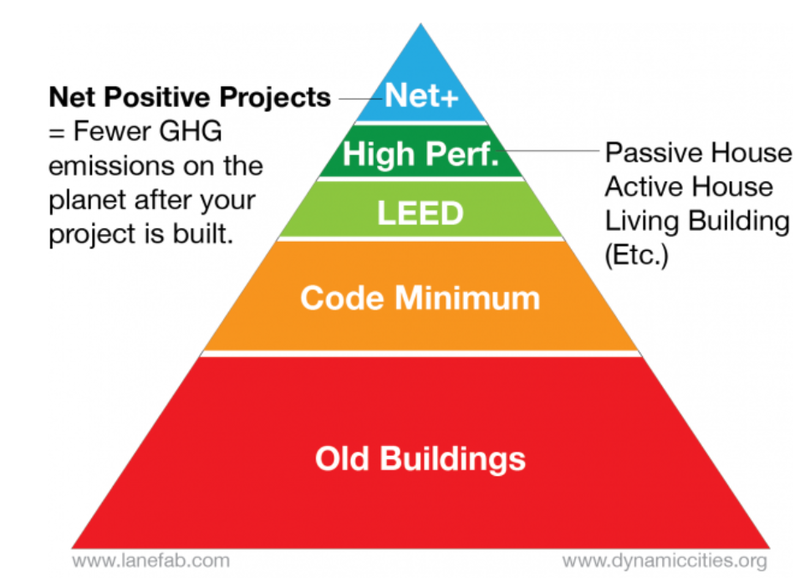 Potentially even better than LEED-conforming buildings would be developments based on high-performance standards such as ‘Passivhaus‘ principles, or-best of all- buildings that are ‘net positive’, ‘Net positive’ buildings are not just minimally impactful in terms of energy use, but also help restore existing environmental degradation. What are the barriers to achieving greater sustainability of design in the built environment in Princeton? One challenge arises from objections to building in walkable areas. Despite the environmental benefits of walkability, the tendency is to limit redevelopment in close-in neighborhoods, which pushes development to car-dependent sites at the urban periphery. The tendency to require new buildings to fit a ‘Princeton aesthetic’ (vague colonial pastiche with ornamental shutters) may also be an impediment to implementing innovative designs that are net-zero or net-positive. Both examples demonstrate the importance of considering the sustainability impacts of the zoning code, which may be limiting our ability to respond to environmental challenges. What’s your take on modern green building codes? Is LEED the best framework, or could we aspire to a higher standard? And how can we maximize the benefits of walkable infill sites? Have your say in the comments section below. This entry was posted in architecture, planning, Princeton, Sustainability, Zoning and tagged leed, living buildings, net-zero, passivhaus, Princeton, sustainability. Bookmark the permalink. I often wonder about all the knockdown-rebuild-McMansion-ization that is going on in Princeton – how energy efficient are those buildings? It seems to me that because of their large size they are inherently energy inefficient. I assume that they would fall under ‘code minimum’ which means that the days of building ‘code minimum’ buildings are unfortunately very much still with us.